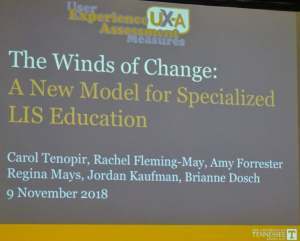 Carol Tenopir, Chancellor’s Professor, University of Tennessee School of Information Sciences, and her students and colleagues reported on a three-year user experience (UX-A) project at the University of Tennessee. The goal of the project was to create specialized educational assessment of experiences; its unique feature is building the collaboration. Students come out of their education with an MLS degree and take courses on assessment, which are combined with workplace mentoring, training, and collaborative experiences. They partner with experts from information-intensive environments to share ideas. There is a growing need for assessment librarians but they do not learn it in their MLS programs. This project was funded by IMLS and the Laura Bush 21st Century fund. Further proposals for collaboration are solicited; the deadline is mid-September 2019. 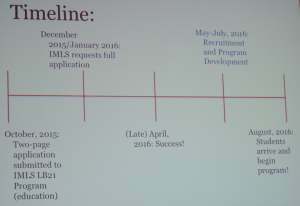 Here is the timeline for the implementation of UX-A. Twelve students were needed for the program. In the first year, they took the required SIS MSIS curriculum plus additional courses on human-computer interaction, research methods, academic libraries operation, special libraries, and statistics. In the second year they will take a new course on planning and assessment plus some subject-area courses. Online courses from lynda.com were used where appropriate. Weekly meetings with the students were held and were favorably received by the students. Students are required to participate in a practicum and were paired with a mentor from a partnering organization who can guide them after they finish the program. Practica were scheduled for 2 semesters and received good feedback from students and mentors. Longer terms gave better context for students and engage in peer to peer learning. Research projects were rated the most insightful by the students. Two students described their expectations and experiences. They were pleased that they received real world experience. 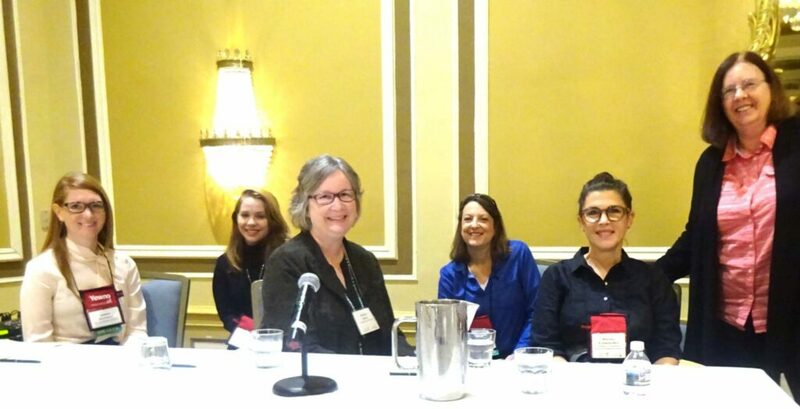 Mentors trusted students and made them feel valued because they were treated as colleagues and were able to transition successfully from students in a practicum to professionals. They gave presentations at professional conferences and published papers. The experiment was a success; students went to work for many different organizations. 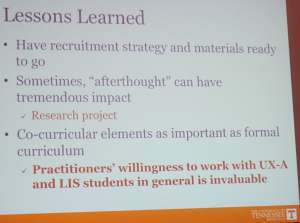 Major lessons learned were that the relationship between LIS education and practice is important. Students received a significant benefit from hearing from practitioners. Distance education was considered but was not implemented; students were required to be on campus so they could use campus facilities such as libraries and closely interact with mentors from the local area.